The assassination of the Head of ‘the Department’ – Britain’s very secret and very ruthless counter-intelligence unit – is the opening move in a conspiracy of global proportions and the UK is only the first nation to be held to ransom. Suspicion falls on the IRA, militant trades union extremists, an unholy alliance of terrorist groups including the Bader-Meinhof gang and, with the Cold War still raging, old enemies in the KGB, but what is clear is that the Department is under attack. In the vanguard of the counter-attack is the tough and resourceful agent Al Trelawney, a man committed to taking the fight to the enemy. When the enemy is discovered to be a shadowy and powerful international consortium known as The Standard Bearer with operational bases in Britain, America and Germany, Trelawney has his work cut out for him especially as the enemy seems suspiciously able to anticipate his every move. With Trelawney and the Department, however, it is always safer to expect the unexpected. 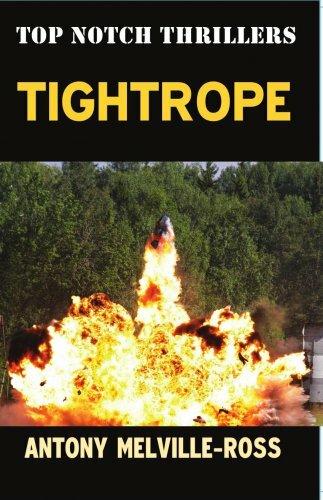 Newspaper reviews of Tightrope praised Antony Melville-Ross’ “complete mastery of complicated plotting and compulsive narrative power” and declared that he ranked “alongside the likes of Bagley, Higgins and Maclean”.